HST has lots of experience teaching children and teens. Special kid's rigs are available to make learning fun and safe for anyone over 60 pounds with the ability to swim. All lessons are available everyday except Sundays and holidays. We recommend that you make advance reservations for at least your lesson appointment. This will give you priority for scheduling during your stay and most likely place you in prime time for the best conditions during the day. All lessons are guaranteed for conditions. Package prices are available. There is no prepayment necessary but a credit card number must be used to make a reservation. A 24-hour cancellation is required. You pay them directly before departure as well. BEGINNER: Experience the thrill of sailing your first time out. Covers uphauling, sailing stance, steering, and turning around. All equipment including life jackets and aqua-socks. All ages 7 to 70, special kids rigs available. LONGBOARD SAILING:Gain confidence and rig control. Covers sail-trimming, upwind sailing, tacking, downwind sailing, jibing, beachstarting, and safety procedures. All equipment included. We sail with you. WATERSTARTING: Breakthrough to shortboard sailing in over 15 knots. Covers waterstarting in both directions with emphasis on getting back to shore. Equipment not included (special rental rates available). We're in the water with you. 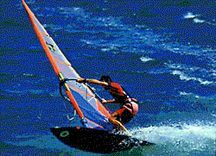 SHORTBOARD SAILING: Hook in and hold on as you learn to sail with all the wind's power! Covers rig tuning, harnessing, upwind sailing, footstrap use, and troubleshooting. We sail with you! JIBING: Learn to turn with a pro. Covers turning downwind, foot transition, jibing of sail and troubleshooting with on-land and water instruction. We sail with you. The most proficient and cost effective way to learn at any level is one on one.